In Egypt, Generals Will Be In Control 'Until October, At Least' : The Two-Way The generals who have effectively been running things since Hosni Mubarak's regime was toppled in early 2011 will be "around and in charge" for months, NPR's Soraya Sarhaddi Nelson reports. Supporters of Muslim Brotherhood candidate Mohammed Mursi (in portrait) celebrated today in Cairo's Tahrir Square. 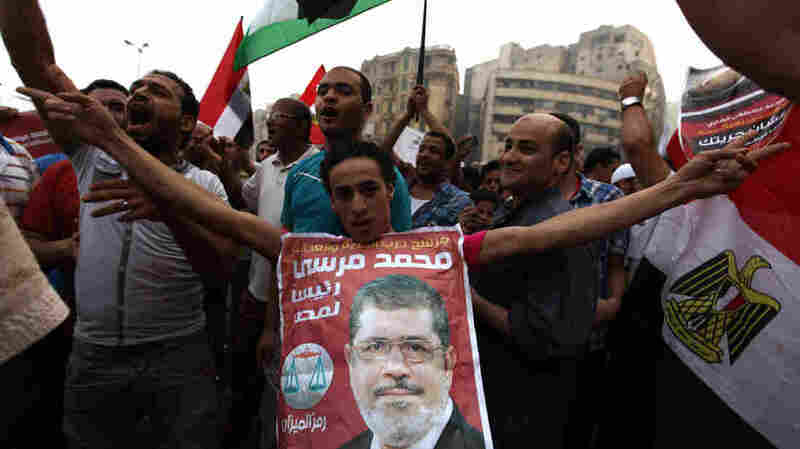 In Egypt, "it's quite confusing at the moment," as NPR's Soraya Sarhaddi Nelson said earlier on Morning Edition. But she says one things seems clear: Based on the decree they issued this weekend the generals who have effectively been running things since Hosni Mubarak's regime was toppled in early 2011 will be "around and in charge until October, at least." -- According to an Associated Press alert, "Egypt's military says it will hand over power to newly elected president by end of the month." But Soraya adds in a message to our Newscast Desk that the generals "will share legislative power with the president." -- "An election committee source told Reuters that Islamist Mohammed Morsi, a U.S.-educated engineer, was comfortably ahead of former air force general Ahmed Shafiq with most of the votes tallied. But the count, which would make him the first civilian leader in 60 years, had yet to be officially finalized." Those official results are expected on Thursday. -- Shafiq's campaign, as the AP writes, " challenged the Brotherhood's victory claim." Shafiq was the last prime minister in the Mubarak government. -- The BBC puts the news of the generals' power grab this way: The Supreme Council of Armed Forces' declaration "effectively gives the Scaf legislative powers, control over the budget and who writes the permanent constitution. ... It also strips the president of any authority over the army." As we said, the story is confusing and changing by the minute. For live blogging, there's The Guardian and al-Jazeera.